The offer and sale of products on the website www.canali.com (the “Website”) represent a distance sales contract. The offer and sale of products on the Website are regulated under these general sales conditions (“General Sales Conditions”) and applicable law in force. These General Sales Conditions are applicable to all distance sales of CANALI products made through the Website (the “Products”). Taxpayer Identification Code and Monza e Brianza Company Registration No. You can in any case request information from our Customer Service. You can always contact the Seller by phone calling 800 98 90 60 (from Italy) +39 02 23345 876 (from the others European Countries) or by email writing to customer.care[AT]canali.com. The use of the distance selling service described in these General Sales Conditions is reserved exclusively to consumer customers, where by “Consumer” is meant any physical person making purchases for purposes other than a business, commercial, artisanal, or professional activity. By accepting these General Sales Conditions, the client acknowledges to be a Consumer. Making a purchase order through the Website implies the understanding and full acceptance by the client (the “Client”) of these General Sales Conditions. The General Sales Conditions do not regulate the provision of services or the sale of Products by any third party other than CANALI, including in case products may or services be present on the Website via links, banners, or other hypertext connection. Austria, Belgium, Bulgaria, Croatia, Cyprus, Czech Republic, Denmark, Estonia, Finland, France, Germany, Greece, Hungary, Ireland, Italy, Latvia, Lithuania, Luxembourg, Malta, Netherlands, Norway, Poland, Portugal, Romania, Slovakia, Slovenia, Spain, Sweden, Switzerland, and United Kingdom. These General Sales Conditions are published on the Website for the purpose of enabling Clients to understand, examine, store, and reproduce them. CANALI reserves the right to change these General Sales Conditions. The new General Sales Conditions shall be applicable as of the date of their publication on the Website. The Client’s purchase orders sent by the Client (“the Order” or “the Orders”) may be made through the Website only by persons of age who are not subject to any legal incapacity. The Products shall remain the property of CANALI until the payment of the total sum due by the Client (“Total Sum Due“) is made. CANALI will deliver the Products only after receiving the confirmation of the successful payment of the Total Sum Due by the Client. The Client selects the Products they wish to purchase featured in the Website, and enters them in the virtual shopping bag. CANALI adopts suitable measures to ensure that the photographs featured on the Website are faithful representations of the original Products. However the images and colours of the Products for sale on the Website may be subject to variations according to the browser and/or monitor used. CANALI is not responsible for any discrepancies in the visual representation of the Products that cannot be avoided through reasonable technical measures. CANALI reserves the right to remove any Products from the Website at any time and/or to delete or change any material or contents thereof. CANALI is not responsible towards Clients or third parties for the removal of any Product from the Website. Before completing your purchase, the Client is responsible for ensuring that the items in the virtual Shopping Bag are accurate, and to enter any promotional code, where applicable, in the dedicated section. To complete the Order, any Client who is not already registered or does not desire to be registered with the Website, or who may have decided to make a purchase without logging in, is required to enter an e-mail address, either directly or through third party services, such as Facebook Connect. CANALI is not responsible for the operation and the activities linked to the use of said services. The Client will then be required to indicate an invoice address, to which CANALI will send the purchase invoice, and to fill out all the related fields. Indicating an invoice address is mandatory in Italy for purchases of 3.600 Euro and above. The Client must then select a shipping method and indicate a shipping address, if other than the invoice address. If the Client selects to collect the Products at one of the CANALI sales points or at the express carrier’s collection points, they are required to specify the address chosen among those available. The Client shall then select the payment method and enter the data required. Should the Client select to pay via PayPal, they will be redirected to the Paypal page. The Order is sent to CANALI when the Client confirms that he/she wants to proceed with the purchase, selecting the specific button. Once the Order has been registered, and upon receipt of the confirmation of the validity of the payment instrument used by Client, CANALI will send to the Client, at the indicated e-mail address, an email of Confirmation of the Order, containing general and special terms and conditions applicable to the contract, including the information regarding the number and date of purchase, the ordered products, their price, the amount of the Order, inclusive of shipment expenses and applicable fees, as well as information about the right of withdrawal and time and ways of standard withdrawal and about the customers assistance services (“Order Confirmation Email”). The agreement entered into between CANALI and the Client (the “Agreement”) shall become effective only when the Order reaches the server of CANALI. The Order will be filed in the database of CANALI for the time required for the processing thereof and, in any case, according to the time limits set forth by law. To gain access to the Order, the registered Client can consult the Website section "My Account", and can in any case make reference to the Order Confirmation Email. The languages available to Clients for the conclusion of the contract are Italian and English. The Customer Service can communicate with Clients in the same languages. The Customer Service is, in any case, available to Clients for any clarification and to offer assistance in making the Order. The Products offered in the Website are articles of clothing and accessories of the brand CANALI, available at the time when the Client places the order. Products availability is constantly monitored and updated by CANALI. Nevertheless, since the website may be visited simultaneously by various Clients, it is possible that more than one Client purchases the same product at the same time. In these cases, the Product may appear as available for a short time, even though it is actually finished or not immediately available, since it is necessary to wait for new availability. ii. should the Product not become available again: the supply of a different Product, of equivalent or higher value, upon payment, in the latter case, of the difference, upon prior approval of the Client. Should the Client decide to terminate the contract, CANALI will refund the amount eventually already paid by the Client without undue delay and, in any case, within 15 working days starting from the day on which of the order has been placed. The refund amount will be credited to the Client with the same form of payment used by the Client for the purchase. The Client may cancel the Order by contacting the CANALI Customer Service by phone, exclusively before shipment of the Products. This cancellation right is additional to all statutory Cancel, Return, and Reimbursement rights. If the Total Sum Due is not paid or if the successful outcome of the payment is not confirmed, the purchase contract shall be considered legally terminated pursuant to and in accordance with article 1456 of the Italian Civil Code. The Client shall be informed by e-mail of the contract termination and of the subsequent cancellation of the Order. The Website registration and creation of an account by the Client is optional and not mandatory. Clients who decided to register with the Website may access their Order and the General Sales Conditions accepted and all the information on how to exercise the order Cancellation by consulting the “My Account” section, where Clients can also access the purchase history and print the relative documentation. The Product prices are inclusive of any additional tax and duty, and of all ordinary national shipment costs, unless otherwise indicated in the Website or in the sub-total in the shopping bag section for each order. The prices of the Products offered through the Website may differ according to the different Countries in which the Product is sold or shipped to. The promotional codes can be used exclusively for distance sales of CANALI Products through the Website. The promotional code is valid only for the period indicated in the code itself, and it may consist of a discount or a gratuity of a particular type of service. It may be limited to only some Products, and valid in certain Countries only. The promotional codes are not cumulative and may be used for one order only. The promotional code must be entered by the Client after selecting the Products, in the dedicated section at the start of the purchase procedure. All payment services available do not have any differentiated or supplementary costs. The validity of your credit card could be verified through a pre-authorization process. This pre-authorization will not charge your card, in any case the payment is charged to the Client’s credit card upon shipment of the purchased Product. In case of PayPal payment, the Client will be redirected to the website www.paypal.com, where the Client shall make the payment for the Products according to the prescribed procedure regulated by PayPal and the terms and conditions of the contract agreed by the Client and PayPal. The data entered on the PayPal website will be processed directly by PayPal and will not be sent to or shared with CANALI. CANALI is therefore unable to know, or store in any way, the credit card details linked to the Client's PayPal account, or the details of any other form of payment linked to said account. The Total Sum Due will be charged by PayPal to the Client's account at the same time as the conclusion of the online contract. In case the contract is terminated or in any other case of refunding, for any reason, the amount of the refund due to the Client ("Refund Amount") shall be credited to the Client's PayPal account. The term for crediting the sum on the payment tool linked to this account depends exclusively on PayPal and the bank system. Once the credit order has been arranged in favour of said account, CANALI shall not be deemed liable for any delays or omissions in the crediting of the Refund Amount to the client. For any such problems, the Clients shall directly contact PayPal. All the payments made through the Website are routed through secure servers, administered online by the interested bank or providers, who are the only parties responsible for the automatic storage and processing, within a protected environment, of the Order payment information, including credit card details. Should the direct or queued debit of the payments due by the Client be declined, for any reason whatsoever, the purchase contract shall be considered legally terminated pursuant to and in accordance with article 1456 of the Italian Civil Code. The Client shall be informed by e-mail of the contract termination and of the subsequent cancellation of the Order. The Products are delivered exclusively within the territory from which the Client has accessed the Website. No delivery may be made to post boxes. The Client may request the Products to be shipped to a third party, as long as such third party is located within the same Country as the Client. 2) Pick Up in Boutique with delivery within 4-7 working days exclusively at the CANALI Boutiques providing such service, as listed in the Website in the Delivery and Shipment section. 3) Express Service: delivery within 2-3 working days, only to the address indicated by the Client. By no later than 10 working days following the date in which the Order has been placed, CANALI will send the Client an e-mail containing the shipment tracking code (“Shipment Confirmation Email”), which will be available, to Clients who have decided to register with the Website, also by accessing the “My Account” section. In any case, for any information on shipment and delivery, the Client may contact the CANALI Customer Service. The above terms of delivery elapse starting from the date in which the Client riceived the Shipment Confirmation Email. It is understood, however, that ordinary delivery times are purely indicative, and that the Products will be delivered by no later than thirty days following the conclusion of the sale contract. The costs relative to the delivery methods listed under 1) and 2) are included in the sales price, while any additional shipment cost for the “Express Service” delivery method listed under point 3) shall be payable exclusively by the Client. The above additional shipment costs, that the Client decided to incur to have the shipment with Express Service are not reimbursable in any circumstances. In case of withdrawal by the Client or replacement of defective Products, only the expenses for ordinary shipment will be reimbursed. The Client (or the designated recipient) may check the conditions of the unopened package for any flaws or signs of tampering, and, if possible, open the package before the carrier to inspect the state of the Product inside the package. Should the Product be damaged, the Client (or the designated recipient) must detail in writing, in the delivery note, all the damages detected. Any complaints must be submitted following the procedures detailed under Article 14 below. Should the Client make a complaint for the loss, lack of compliance, or damage of the Product, CANALI shall replace it free of charge if the Product is available, or reimburse the Client, upon express request by the latter, according to the manner and within the time limits indicated below. Where this service is available, CANALI offers its Clients the choice to collect the Products purchased on the Website either at some of its Boutiques, or at one of the Express Carrier Collection Points. Before closing the purchase procedure, the Client must select one of the options - “Boutique Pick Up”, “Pick up at the Express Carrier collection point” - and select an address among those available in the list featured in the Website. 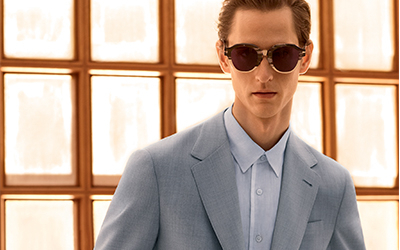 CANALI will send the Client an e-mail when the Products purchased have reached the chosen address, indicating that the Products shall remain available for pick up for up to 10 days following the transmission of the e-mail. Upon expiry of such period, the Products purchased are deemed to have been forfeited and are free to be used by CANALI, who then proceeds to reimburse the Client for the price of purchase of said Products. Once the Client has received the confirmation e-mail, the Client must personally collect the Products purchased, and provide the confirmation e-mail and a personal ID. The Products collected in Boutique or at an Express Carrier collection point are subject to the same terms and conditions for Product return and replacement as per Article 15 of these General Sales Conditions. In any case where a Client has delegated a third party to pick up the Products at one of the Express Carrier collection points or CANALI Boutiques, the Products shall be handed to the delegated party only upon presenting a copy of the email containing the purchase reference number, along with a proxy for collection signed by the Client, and a copy of the delegated third party’s valid ID. The Express Carrier staff or the Boutique’s sales staff may decline to hand the Products if the Client has not complied with the collection procedure. CANALI offers clients who purchase products for themselves or a third party (“Beneficiary”), within the same country where the local site in connection to the client is located, the possibility to purchase a Gift Package. c. in the case of delivery of a good consisting of multiple lots or pieces, the day on which the consumer or a third party other than the carrier and indicated by the consumer acquires physical possession of the last lot or piece. The same terms apply in case the Beneficiary returns the Product. The right to cancel does not apply to any Bespoken or Customized Products, including when customized after purchase. For the purpose of exercising the right to cancel, the Client may follow the online procedure present in the “My Account” reserved section and follow the links provided in the shipment confirmation. For any questions they may contact the Customer Service. Clients may select the Order they wish to return, fill out the online form, select the Products to return, they may choose to indicate the reason for the return, select the return method, confirm the procedure and select the option Return Items. CANALI advises Clients to follow the online cancellation procedure for the purpose of speeding up and simplifying the return procedures, but Client may choose, in any case, to send a written communication to the Customer Service of CANALI, explaining the decisions for withdrawing from the agreement, within the terms indicated in this article, or using the form available here, and CANALI shall promptly send a written confirmation of receipt of the withdrawal. The Client must then send the Products without undue delay, and in any case within 14 days from the return notification to CANALI. The Client must always return the Product by applying over the package the adhesive label with the Express Carrier return code provided by CANALI upon delivery. Should the Client decide to use a different shipment method for the return items, other than the methods listed above, the Client shall be liable for any theft, loss, and shipment costs, which CANALI shall reimburse only in the measure equivalent to the standard cost of shipment of the Products purchased. The returned items are then checked by CANALI. For any reimbursement, CANALI will have 14 days time as of the cancellation notification from the Client. However, CANALI may withhold the reimbursement until receipt of the returned Product, or until the Client demonstrates that they have returned the Product, according to which of the above occurs first. The Client will be reimbursed of all payments made to CANALI including delivery costs for ordinary shipment. Said reimbursements will be made using the same payment method used by the Client for the initial transaction, unless otherwise expressly agreed by the Client and CANALI. The Beneficiary who intends to return a gift may contact the Customer Service directly and follow the instructions to return the same. In no case will the relative refund be made to the Beneficiary who has received the Product as a gift. The refund will always made directly to the Client. In case of any issue with the returned items, the Clients are contacted by CANALI’s Customer Service for further clarifications. CANALI reserves the right to reject the return of Products that appear damaged, incomplete, deteriorated and/or dirty or in any state that unequivocally reveals that the Products have been utilized. Should the Client assert to have received the Products in a damaged state, they must be returned exactly as received by the Client, without the Client having made any modification or attempted any repair. Should the above method and time limits for exercising the right of withdrawal not be complied with, the Client shall no longer be entitled to receive any reimbursement. We remind that the Client can in any case request information, included information regarding the Post-Sale Assistance, to our Customer Service and can always contact the Seller by phone calling 800 98 90 60 (from Italy) +39 02 23345 876 (from the others European Countries) or by email writing to customer.care[AT]canali.com”. The Client is entitled to the legal product warranty in case of lack of conformity of the Products that manifests itself within 2 years following the shipment of the Products Any flaws and defects must be reported to CANALI within 2 (two) months following the date when the defect was detected by the Client. Any action relative to such flaws or defect shall no longer be exercisable past 26 (twenty-six) months from the delivery of the Product, except in case CANALI shall have willfully concealed the flaws. Unless otherwise demonstrated, it is assumed that the conformity defects found within the first 6 months after the Product delivery date were already existing on that date, unless such an hypothesis is incompatible with the nature of the Product or the nature of the conformity defect. The guarantee offered by CANALI is the guarantees specified by the Consumer Code in Articles 128 to 132. A Client who, within the above time limits, believes that the Product received are affected by a lack of conformity or they are not fit for the purpose for which the Product was created, may contact CANALI’s Customer Service and receive assistance for the remainder of the procedure, or may send a letter via registered mail with return receipt to the address CANALI S.P.A. / Uff. Commerciale / Reclami Prodotti – via Lombardia 17/19 20845 Sovico (MB). If CANALI ascertains the flaws or lack of conformity of the Product, the Client is entitled to restoration of the Product at no cost, either by repair or replacement of the Product, unless the remedy requested is objectively impossible or excessively costly as compared to the other. Where no repair or replacement of the Product purchased is possible, or the repairs cannot be completed within a reasonable time, the Client may request a reasonable reduction of the price or withdraw from the agreement, without prejudice to the right for greater damages, if due and when proven as to their causal link and amount. b) if the Product has been repaired / modified without inform CANALI and without its authorization. CANALI guarantees the authenticity and high quality of all the Products offered for sale on the Website. The Legal Area section in the Website provides to Clients all the information concerning the handling of their personal data and the Website’s cookies . The orders made based on these General Sales Conditions are regulated under the laws of Italy, and particularly under the Consumer Code. The Vienna Convention for the sale of goods of 1980 shall not be applicable, without prejudice of the application of the mandatory local laws and regulations connected with the residence or domicile of the Client. The venue having jurisdiction over the sales contracts concluded through the Website is the venue with jurisdiction over the place of residence or domicile of the Client. Disputes may be settled also through mediation procedures, or by promoting the extra-judicial settlement of disputes. In case of dispute with a Client, CANALI guarantees henceforth its willingness to take part in an attempt to reach an amicable solution of the controversy, which the Client may bring before RisolviOnline , an independent and institutional service provided by the Chamber of Arbitration, a branch of the Chamber of Commerce of Milan, which allows the reaching of a satisfactory settlement between the parties through the intervention of a neutral mediator, through an amicable and safe process. The Client can also use the online platform provided by the European Commission for the alternative out-of-court settlement of disputes (so called “ODR platform”), available at the following address http://ec.europa.eu/consumers/odr . The Client will be in all cases entitled to make an application to the court having substantive jurisdiction.